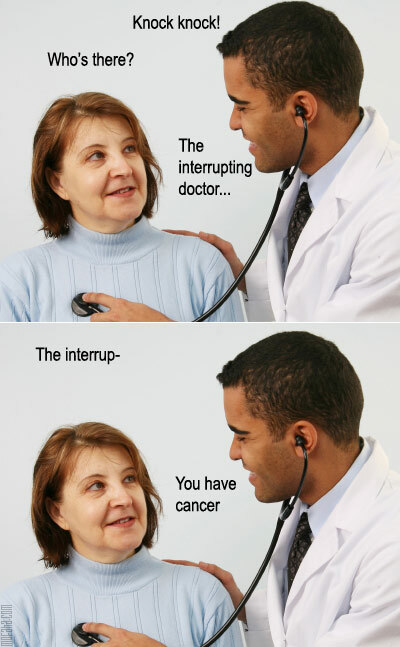 Funny doctor jokes are some of the best jokes out there, mostly because doctors are anything but funny. If they were, these 10 funny doctor jokes might be a little more accurate. But the bottom line is they make us laugh! Below are 10 of our favorite funny doctor jokes floating around the interwebs today. What do you call 2 orthopedic doctors reading an EKG? A double blind study! Q What is the difference between God and an orthopedic surgeon A God doesn’t think he is an orthopedic surgeon. Did you hear about the latest birth control pill for men? You take it the day after. It changes your blood type. Q: Did you hear about the optometrist that fell into his lens grinding machine? A: He made a spectacle of himself. Why did the guru refuse Novocaine when he went to his dentist? He wanted to transcend dental medication. What do you call a depressed dentist? A little down in the mouth. Doctor: Nurse, how is that little boy doing, the one who swallowed ten quarters? Nurse: No change yet.